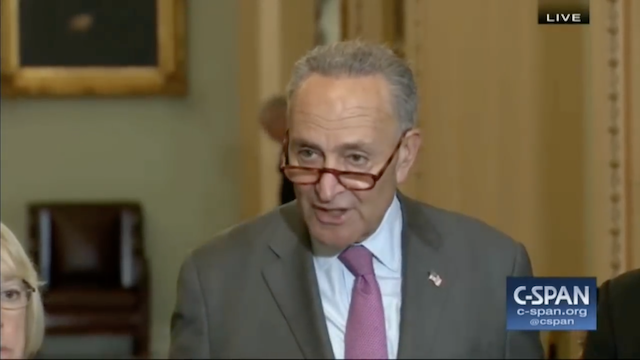 Chuck Schumer, the Minority Leader of the United States Senate looked straight into the cameras and said there is “no presumption of innocence” for Judge Kavanaugh, and frankly that “rule” now applies to everyone… who isn’t democrat. The presumption of innocence, burden of proof on the accuser has been a staple point of America for generations to our founding, be it criminal court to civil matters. The accuser comes forward make their case and then the accused defends themselves, but no more per Schumer and the democrats. All of that is thrown out because they have to do everything possible to keep Brett Kavanaugh* from becoming a US Supreme Court Justice. Again this new rule isn’t just limited to Kavanaugh it will apply to everyone, do not dismiss this warning. Yes, in a normal court proceeding you’ll face your accusers, but in the public court of opinion you’re done if you’re doing anything that goes against liberal progressive ideology. Work, school, a committee, or club whatever it is you’re a part of, if you get accused you’re guilty. I guarantee this garbage coming from the democrats will spill over to our day-to-day lives. It already has in many cases, but now with this circus #MeToo #BelieveSurvivors thing going on more attention is on it where progressives are setting the new rule of guilty until proven innocent. If you want to stop this insanity coming from the democrats you better get and vote for republicans this November otherwise you’ll have no one to blame but yourselves. Take note the dems are adamant they want an FBI investigation even though their own Joe Biden made it VERY clear the agency doesn’t not make conclusions! * To be clear, the only reason democrats have brought the axes out now is because they’re obsessed with abortion, that is what this is really about. Democrats think if Kavanaugh becomes a justice then Roe v Wade will be overturned. Granted there are no cases pending that doesn’t matter, all these monsters care about is their right for on-demand abortions!